The holy grail of locally specific novelty tunes is probably Dale Menten’s plaintive 1975 M.O.R. love song “Downtown Bloomington.” I think I heard it for the first time on Ron “Boogiemonster” Gerber’s great KFAI program “Crap From the Past” a few years back, and I still think of it anytime anyone mentions going to Bloomington. You and me both, Dale. As I’ve mentioned in previous columns, the identity of Bloomington’s downtown is a long-running and unsolvable Twin Cities joke. Despite being the fourth-largest city in the state – larger than Duluth or St. Cloud – it doesn’t really coalesce around any particular central business district. Despite having roots as a small village along the Minnesota, Bloomington is really the consummate 20th-century settlement. It was built to be navigated and experienced by automobile, and the idea of a “downtown” commercial district is a very 19th-century one that just doesn’t apply. And here something begins to take shape. There are a few images of what certainly appears to be a small, prosperous Midwestern city. It even appears to have something approaching a central business district. A panoramic view from Bush Lake Road. Wells Fargo Plaza is right in the middle. Bloomington does in fact have a traditional skyline, if not a traditional central business district (it’s too dispersed). The skyline is pretty impressive by regional standards. Stretched over a few miles of I-494, you have quite a few skyscrapers that are as tall or taller than anything in Rochester, Duluth or St. Cloud. If you were to sit all the non-Minneapolis and St. Paul skyscrapers side-by-side – and in fact, this is something you can do on the great website Skyscraperpage – you’d find that in terms of combined building stories, Bloomington is roughly on par with Rochester. It also edges up into the atmosphere quite a bit further than Duluth, which is almost the exact same size. If you planted all of Bloomington’s office towers into one cluster and stuck them on the prairie a hundred miles away from the Twin Cities, no one would mistake it for Minneapolis or St. Paul, but it’d be considerably more impressive than the skylines of Fargo, Sioux Falls, Madison, Green Bay or Cedar Rapids. For what that’s worth. Central to most of these photos of Bloomington’s elusive skyline, and the tallest of all of them, is the 8500 Tower. That’s 381 feet of glass-enclosed suburban corporate muscle, sitting on the shores of Normandale Lake and surrounded by a few other high-rises of a late-’80s vintage. The Sheraton Bloomington hotel, Bloomington’s first high-rise and still its fourth tallest, is only a mile or so away. Seen together in a group, all of these structures do look as close to a traditional downtown as you’ll find. It looks maybe like the sort of place a girl in a mid-’70s love song might tell you to meet her, even if they were all built 10 years later. The 8500 Tower: half an IDS. Ah, but when you do see these all together, it’s typically from out the window of a car driving down 494, which is certainly as its developers intended. Looking at it up close is a slightly different experience. On a Sunday morning, the area – officially designated the Normandale Lake Office Park, and complete with a cool, ubiquitous logo that looks like something from an ’80s sci-fi action movie – is very quiet. The towers are all mostly locked up, preventing the possibility of sneaking up to a top floor for a panoramic view of the river valley. However, there is a Kincaid’s on the first floor that gets a lot of activity for brunch. Most of the diners are entering from the parking garage on the first level. While there’s not a lot of foot traffic outside, the central atrium does have a certain town square sort of quality. And anyway, plenty of parts of downtown Minneapolis and St. Paul are close to deserted on a Sunday morning, too. A ski chalet at Hyland Hill, on the way across 494. 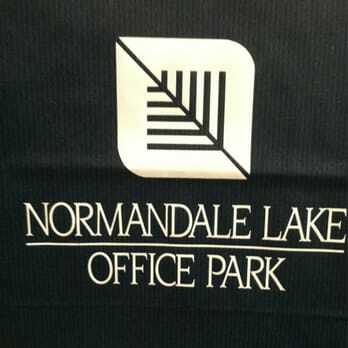 Normandale Lake Office Park is situated on the shores of Normandale Lake, which is itself at the top of a massive park and recreation area. The immediate area around 83rd Street and Normandale Lake Boulevard does look more or less like a small downtown – on the office park’s website, a resident is even quoted as saying, “Appreciate the walkways between buildings making it feel just like downtown Mpls.” But it’s a tightly contained illusion. Walk behind the 8500 Tower, and you’re in the park. North of the building, wedged in between them and 494, there are a number of marshy lakes, and the spectacle of flocks of geese crossing service roads. West of the cluster of towers, you can also clearly see another noted Bloomington high-rise: not an office or residential tower, but the Hyland Hill ski jump. Besides the ski jump, the Sheraton Hotel is the next highest point on the immediate horizon, so I decided to walk from Bloomington’s tallest building to its fourth largest. Most suburbs, however, don’t do straight lines, and this part of Bloomington is no exception. The path is indeed blocked off by 494, which presents an impenetrable wall cutting through the center of Bloomington. The walk is actually more like a full mile and some change, across East Bush Lake Road and down 78th Street. You walk parallel with an active rail line for part of it, and past the edges of the Hyland Hill area, including a smattering of classic wooden ski chalets. The farther you get from the Normandale Lake Office Park, the taller it seems to loom over its surroundings. It’s much more impressive from a distance than it is up close. From a distance, looming over marshy lakes and interstate exchanges and low-rise buildings, it has an Emerald City-like quality. It’s not the destination, in this case, but what you see along the way. (Although the destination was fine, too: Lela, the new upscale restaurant at the Sheraton, has a decent hasbhrowns, and I got to experience a perfectly urban/millenial experience in overhearing two twentysomethings explain the plot of Aziz Ansari’s “Master of None” to their parents over brunch.) Standing on the pedestrian overpass atop 494 and looking east toward the airport and the Mall of America, you begin to understand that this highway is Bloomington’s Main Street. It’s a mid- to late-20th century Main Street, of course; you can’t walk down it, but everything the city has to offer is lined up on either side of it, all in one place. You get the geologic sense of the city’s skyline, growing over the past four decades. You see the older, ’70s-era buildings, like the shimmering gold Riverview Office Tower (1973) near the Mall of America, and the Wells Fargo Plaza (1974), topped off with what was meant to be a revolving restaurant, that ultimate mid-’70s statement of cultural and economic hegemony. That revolving restaurant must have scared the hell out of downtown Minneapolis’ civic boosters in the 1970s, terrified as they were of further losing influence, business and population to the suburbs. The restaurant never materialized, but the hardware is still in place, a crowning memorial to Bloomington’s midcentury ambition. The skyway connecting the 8400 and 8500 Towers. You see the hotels: the 1970s being bookended by the Sheraton, built in 1970, and what’s now the La Quinta, built in 1979. As if to put a fine point on it, the view from this vista is frequently by planes making their descents and departures from Minneapolis-St. Paul International Airport, bringing in the business travelers who will be staying in these airport-adjacent hotels. Through the 1980s and ’90s, the buildings rising to the top of the skyline have been hotels and office complexes. Interstate 494 from the 8500 Tower to the Mall appears to be an unbroken chain of glass- and steel-encased commercial opportunities, powered by air travel and automotive traffic. Maybe that’s why Dale Menten suggests, toward the end of his song, that Bloomington’s downtown is actually located near the Freeway Ford at 97th Avenue on Lyndale, a bit south of this part of town. Certainly having a car with freeway access is the best way to find downtown Bloomington, wherever it might be. Are they in “downtown”? Bloomington is famous for not really having a downtown, in the traditional sense. Submitted by Jim Million on 03/24/2016 - 10:25 am. Cannot be anywhere in West Bloomington, that near Bloomington suburb of ubiquitous American office park confusion. No, I believe downtown remains somewhere along Lyndale Ave. S.
Next assignment, please: Downtown Eagan. Is there any there there? Getting difficult. I nearly missed Downtown New Brighton on the last pass. As for Anoka …. arghh!! Submitted by Rodgers Adams on 03/24/2016 - 10:54 am. 97th St., not 97th Ave. Submitted by David Markle on 03/24/2016 - 11:33 am. Mankato has largely lost its formerly vital downtown. The buildings remain, but the business takes place on strip development along the highway on the eastern edge of town. And what happened to St. Cloud’s downtown, if it ever really had one? Sad. Submitted by L Jensen on 03/24/2016 - 11:48 am. Submitted by James Cullum on 03/24/2016 - 12:39 pm. Back when there were Yellow Pages, David Fong’s advertised itself as being located in “Downtown Bloominton”. Submitted by Steve Sundberg on 04/14/2016 - 04:17 pm. That would square with my youth memories (ca. 1960s) … the old “Oxboro” neighborhood around Lyndale & Old Shakopee Road (98th St.). Richfield’s “downtown” at the time was centered around 66th St. & Nicollet, aka “The Hub”. Submitted by Allan Wilson on 03/24/2016 - 01:11 pm. The Normandale Lake complex (8000, 8200, 8300, 8400 and 8500 Towers) includes over 2 million square feet of first class space and offers virtually every amenity, including unparalleled access to nature. I used to work in the 8400 Tower and fondly remember the times we used to pack the office into a couple of cars and spend lunch hour going for a swim at Hyland Lake! Great place. Submitted by Rick Prescott on 03/24/2016 - 04:58 pm. After reading this, I wondered if you looked back far enough you would eventually find a quaint, old, small town main street for Bloomington that had just been absorbed into the suburb and disappeared over time. But I found no such thing. The closest I came was over at HistoricAerials where, in 1947, you can see the semblance of a main intersection at 98th and Lyndale. Beyond that, it looks like farmland dotted with some small housing developments. So, basically, it looks like Bloomington’s historic downtown and main street is a never-was. Which explains a lot. Submitted by Steve Fester on 03/25/2016 - 02:48 pm. Submitted by John DeWitt on 03/25/2016 - 04:48 pm. The Metropolitan Planning Commission, predecessor to today’s Met Council but without any powers, and the Metropolitan Transit Commission, precursor to today’s Metro Transit, were both advocates for “major diversified centers” throughout the region. These were to be like central business districts on a smaller scale. And still easily served by transit. Sadly, that approach lost out and we have a region of mostly “no there theres” scattered about. But the Twin Cities ranked 23rd in future potential because we simply aren’t developing walkable places in our suburbs. This MinnPost article on Bloomington is a good example of how we’re not doing this. A recent Strib article noted the outflow of young people from the state. We know that millennials tend to be less interested in an auto dominated lifestyle so it’s worth asking if we need to be seriously pursuing walkable development throughout the region if we hope to compete. Submitted by Steve Peterson on 03/28/2016 - 11:48 am. If you’re looking for Bloomington’s transit-oriented, walkable future, you need to be looking east at the South Loop. For starters, much better transit than the Normandale Lakes area. Vision: To transform South Loop from a dispersed, suburban commercial area into a walkable urban neighborhood that attracts residents, office tenants, hotel guests and shoppers by virtue of its unique character and assets.